Spring to me would be spring without the large drifts of bulbs that delight us in the larger parks and gardens. Most of the time, the bigger daffodils steal the show, with their yellow colour brightening up a dull spring day or crocus that open in huge drifts once the sun hits then. Quite often over looked and forgotten, bulbs like Chionodoxia can carpet areas and give us such a clear blue in the spring bulb display. This is the reason it’s my plant of the week this week. Chionodoxia luciliae is one of the bulbs that naturalises areas with ease. Native of western Turkey mainly around the mountain called Boz Dag. It can be found at around 2000ms above sea level, flowering in May and June as the snow slowly melts leading to one of its common names, Glory of the Snow. 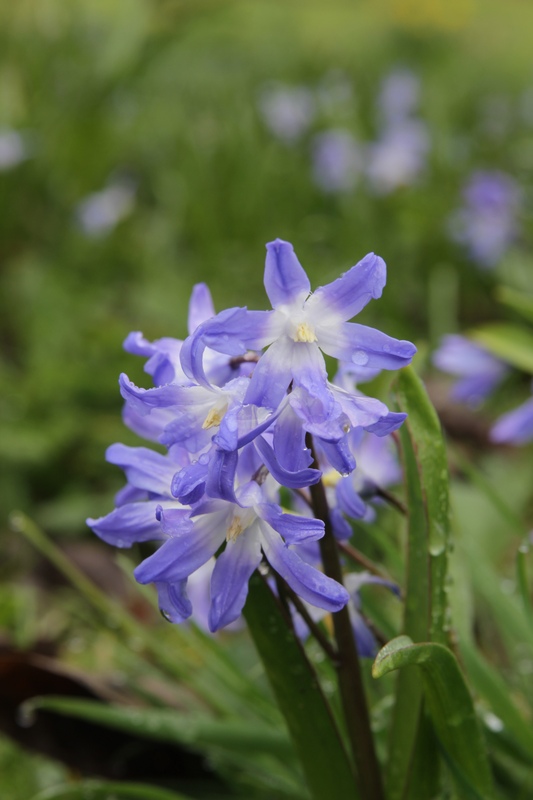 It is thought by some, as a Scilla and they differ from Scilla from the stamens that are flattened at the base. Some botanists don’t think that’s enough and call it Scilla luciliae. It’s Latin name comes from Greek words chion meaning snow and doxa meaning glory, luciliae was after the wife of the great Swiss Botanist Pierre Edmond Boissier, the lovely Lucile Boissier. The classification of Chionodoxias are a little confused with many of the species being grown around the world Horticulturally wrongly named, luciliae is more recognisable than most, flowers are bigger in size than C.forbesii, they normally have 2-3 flowers per stem. The flowers are of the truest blue of all the Chionodoxia and have almost a white star in the centre. Chionodoxia luciliae in the uk, flowers early from February into March, this cold spell has certainly made them flower later this year. It gets to maximum height 15cm tall in full flower, often smaller around 10cm. It flowers for about 3 weeks before finishing and slowly dying down and disappearing for the summer. They grow quite happily in any free draining soil in a sunny or semi shady spot in the garden. Chionodoxia luciliae are planted as a bulb in the autumn about 5cm deep and once established, they can spread by seed quite easily. Next post: Cloud pruning- turning a blob into a sculpture, how to do it! I’ve never heard of that one – it is very pretty! Those have only recently become available in mail order catalogues. I suppose that they have been available online for a long time, but I do not look for them. I really do not know much about them. Sadly, that is how many bulbs are. Even daffodils do not naturalize as well as they do elsewhere. I do not even bother with hyacinth or tulip (unless forcing them) because they work like annuals, but do not even last as long as annuals. Great thanks, I’ll keepy eyes open for some.